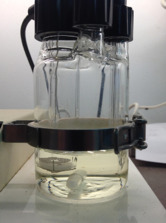 A Karl Fischer Titrator uses two electrodes. 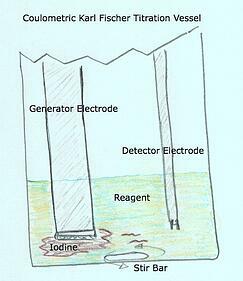 The Inner burette (aka Generator Electrode) and the Detector Electrode. We hope this infromation is helpful in giving some guidance on cleaing and caring for these Karl Fischer Titrator electrodes. If the electrode is heavily stained and the potential is unstable and measurement reading fluctuates clean with nitric acid. After cleaning use methanol and wipe off with clean gauze. Periodic cleaning of the inner burette is recommended if the inner burette is stained and the electrolysis reaction will not run smoothly. 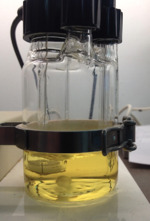 A faulty Inner Burette may cause a longer length of time in the measuring process with measurement results being recorded at higher than theoretical values. Disconnect the electrodes from their ports. Take out both anolyte and catholyte. Wipe off grease around sliding area with methanol. 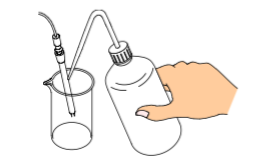 Rinse the inner burette with methanol, and fill it with approximately 10mL of methanol and then put it in a beaker. Fill the beaker with methanol up to the level of methanol inside the inner burette, and leave it for about 30 minutes. After the above 5), dry the inner burette. 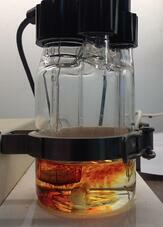 Immerse the diaphragm or the electrode surface in nitric acid, and boil with a hot stirrer. Drain out the chromate inside the cell, and rinse it with pure water for 2 to 3 times until yellowish color disappears. Clean the inner burette with methanol or with alcohol. Repeat the above steps several times when dirt does not come off. If foreign objects are observed on diaphragm and platinum surface, use chromic acid mixture instead of methanol for cleaning. Follow the same steps as above for methanol. Drain out the chromate inside the cell, and rinse it with pure water for 5 to 6 times until yellowish color disappears. Dry it in a decompression dryer for more than 2 hours. 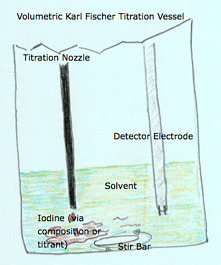 Below sketch shows an example of commercially sold drying under reduced pressure. NOTE: Dry the inner burette itself only after removed from the titration cell in order to avoid possible breakage of inside ceramic diaphragm. SUGGESTION: Use a hair dryer if a compression dryer is not available. With a hair dryer, dry the inner burette well enough as long as for more than 10 minutes, especially dry the diaphragm until it is really dried. Any residue of moisture will cause high drift level. CAUTION: Set the temperature of the constant temperature drying oven at 65°C or below. When drying with a hair dryer, make sure not to overheat its cable and connector. Overheating may result in malfunction. Sample changers that are connected with automatic titrators generally are there for a reason. Efficiency. From an operators point of view getting multiple tests done quickly while being able to take on other tasks in the lab is a key productivity booster. Sample changers offer various sizes ranging from as few as 6 positions for samples up to some of the largest exceeding 50 sample positions. Sample changers either have rotating carousels or an arm that moves electrodes and nozzles from sample to sample. Each time a sample test is completed the electrode must be cleaned before moving on to the next test. Many sample changers offer as standard a dip rinse between sample testing and as the name suggests it's really nothing more then dipping the electrode in clean water or solution. For some samples this process is sufficent but for others it is not enough to effectively clean the electrode before the next test. Luckily most manufacturers of sample changers offer additional cleaning power with the use of a shower rinse system. 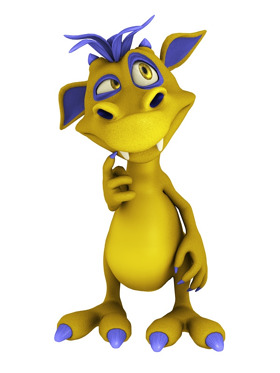 Below is a video showing how a shower rinse process works. Water is stored in a container and then is flushd and rinsed in one of the sample positions designated as the cleaning station. Water is evacuated via tubes to a drain or sink. 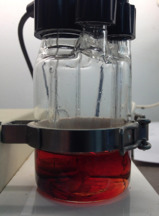 We work with numerous titrator models and encounter many of the day-to-day problems associated with broken electrodes. In many instances some of the electrodes are destroyed beyond repair but in other circumstances we find that some are in fact capable of being repaired. Most of our success with repairing or refurbishing electrodes is with Karl Fischer Generator Electrodes (also known as Inner Burettes). However, we do try to evaluate and determine whether other types of electrodes can be repaired also. Generally we will ask for a photo or other description of the damaged electrode to determine if a repair is possible. An example of how we examine a typical Karl Fischer Generator Electrode can be viewed in the following short video. Take a look and let us know if we can help you.